Dan Pfeiffer, a senior Obama adviser, compared Republicans to terrorists during an interview with Jake Tapper on Thursday. “What we’re not for is negotiating with people with a bomb strapped to their chest,” Pfeiffer said about talks with House Republicans about the so-called debt ceiling, a colorful term for allowing the U.S. Treasury to create more debt so the political class in Washington can spend billions on the war and welfare state. Obama and the Democrats are miffed because quasi-libertarians in the House are demanding a one-year delay of the absurdly and Orwellian titled Affordable Care Act, a halt in construction of the Keystone XL pipeline, and entitlement reforms. In total, this represents at best a trifling portion of the budget, although Republicans will tell you it is a symbolic shot over the bow of tax-and-spend liberals. Pfeiffer was right – Republicans are terrorists. He just neglected to say that Democrats are terrorists too. In fact, the entire U.S. government, but especially the executive, Congress and the Department of Perpetual War, what we like to call the Pentagon, are all part of the largest and most lethal terrorist organization in the world. It has killed millions of people since the end of the Second World War and the establishment of the national security state. It has expropriated trillions from millions of citizen-victims in what is surely the largest organized crime shakedown in history. You’re not seeing House Republicans calling for cutting the Pentagon’s budget. It wants to gut the budget doled out to little old ladies so they can buy their over-priced pharmaceuticals. So desperate are Republicans to salvage the perpetual war budget from the boogieman of sequestration and budget cuts, they have resorted to cooking the books and whining that one penny diverted from the murder machine will imperil the country. In the meantime, so-called defense authorizations bills continue to pile money on the Pentagon. 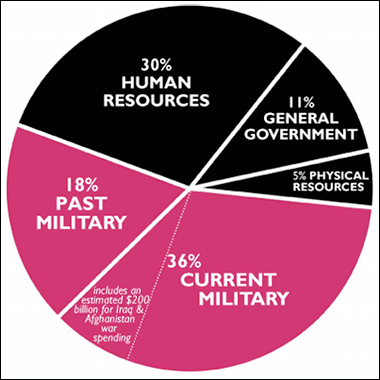 In 2012, the House authorized well over a billion dollars to keep the Department of Perpetual War’s murder spree on course. The endless melodrama between the Obama administration and would-be libertarian tea party House Republicans is nothing but an orchestrated distraction. Obamacare will arrive as promised and the war juggernaut will continue to target small but strategic countries in the Middle East and Africa. It will all end in disaster after the dollar crashes and government becomes the most notorious suicide bomber in history.